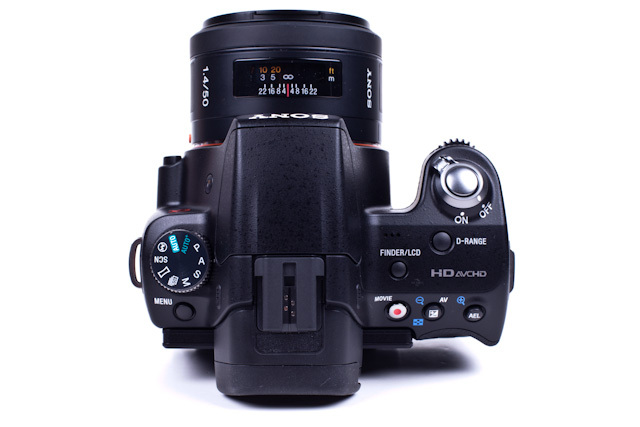 The Sony A55 is the next big step for Sony, which busted onto the scene with the A300 and A350 DSLRs almost 3 years go with their fast live view autofocus. 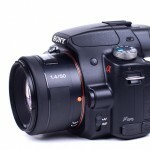 The A55’s live view autofocus is a step above pretty much everything else on the market, including Sony’s prior models. And that, is the biggest and best feature on the A55. The A55 has a 16.2MP CMOS sensor for high-res stills and also captures full 1920 x 1080 HD video. As an entry-level DSLR, the A55 delivers solid results in both categories. 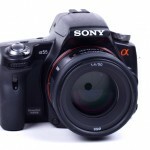 The A55 is a rather compact DSLR-type camera – akin to the size and form factor of the Nikon D3100 and Canon Rebel T3i. The buttons and controls are well thought out, intuitive and easily accessible. Those who are familiar with the operation of DSLRs likely won’t need to refer to the manual to go out and start shooting. However, if you are new to DSLRs, I would strongly recommend reading your camera’s manual (whether the A55 or any other camera) before you head off to capture the world. A once-over the A55’s manual will give you the insight you need to find the appropriate controls. The live view feature works like a charm for still images thanks to the design of the translucent mirror technology. The internal mirror is fixed in place as light passes through the mirror to expose still and moving images, while at the same time redirecting light to the autofocus sensor. 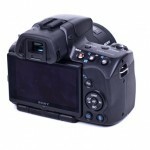 You get ultra-fast autofocus and a proper live view display on the LCD screen. 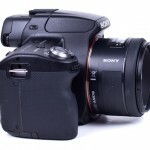 With the A55, Sony has taken the best live view system for DSLRs and made it even better. When shooting videos with the fast live view autofocus enabled, however, the focus is actually too fast. While that statement may not quite sound right, think about the way we see focus change in video. We’ve been trained to experience smooth focus transitions in everything from our dedicated consumer camcorders to feature films. 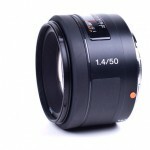 The A55’s video focusing is too quick to transition between distant subjects. The video focus mechanism is the other extreme to Canon and Nikon’s slow, clunky contrast AF system for video (although, Nikon is a step or two ahead of Canon in that regard). 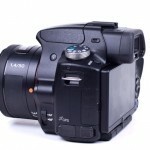 As with other DSLRs, the A55 has not quite arrived as a camcorder replacement. Somewhere between the A55 and the other manufacturers’ contrast detection AF system lies the appropriate video AF solution. Another downer on the A55 is the continuous shooting buffer. While the camera is capable of shooting 10 fps, the buffer takes way too long to recover after a burst of shots. Using a fast SanDisk Extreme Pro SD card, the A55 took over 30 seconds to recover when capturing a burst of RAW files, which is simply unacceptable. As a result, the A55 is of limited use for action sequences. While there are some limitations in this entry-level shooter, Sony puts some stuff in it that’s a little less typical on entry-level models. One of the biggest bonuses is the built-in GPS feature, which automatically geotags your photos straight out of the camera. 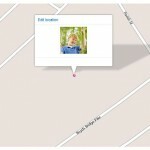 You can then make use of the mapping feature with Google Maps, Flickr or many other online geotagging services. Just make sure that you are aware of the feature and know how to turn it off in the event that you don’t want to post photos taken of your kids at home and then provide a map for the world to see when you upload them to Flickr or other online service. Another bonus for video shooters out there is the external mic port, which allows you to attach an external shotgun mic like the Rode VideoMic Pro (probably the best on-camera shotgun mic for HDSLR-type systems as of this writing). The final, big feature that sets the A55 apart from the competition is the sensor-based image stabilization system, which means every lens becomes a stabilized lens. 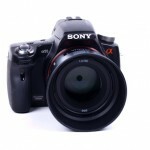 This is an awesome benefit for Sony cameras and something that Canon and Nikon just can’t compete with. 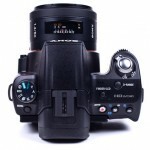 While you’ll hear that lens-based stabilization is better, you have to have a stabilized lens for it to work. Even the cheap $150 Sony 50mm f/1.8 gets the stabilization feature on the A55 since the feature is built into the camera body. Overall, the A55 works and handles well. The grip is a bit small for those with larger hands; however, if you are looking at the entry-level offerings from Canon and Nikon, the A55’s size shouldn’t be a factor. The well-placed controls and smart menu system serve the A55 well. 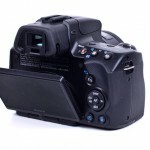 Just make sure that you aren’t expecting too much out of the video autofocus or need to use it for fast-action sports. I was very pleased with the overall image quality in both photos and videos. While I’m not going to delve into the minute details of noise control and ISO comparisons that I have done in the past, I will say that I wouldn’t hesitate to shoot side-by-side with a Canon 60D or Nikon D7000 with similarly-equipped lenses on the A55. 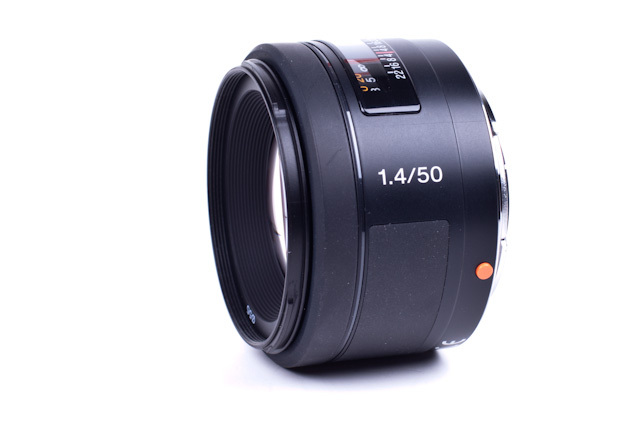 Sony 50mm f/1.8 lens – This is a great lens for the A55 – even if you are a beginner. The large aperture (indicated by the “f/1.8” in the lens description) will give your images that defocused background (or, “bokeh”) that makes your portraits really pop. Note that most of the above images were captured with the even better Sony 50mm f/1.4 lens, which also costs a bit more but is a really nice lens. However, if you don’t want to commit that much to a lens, go with the 50mm f/1.8 as it is available at a bargain price of around $150. 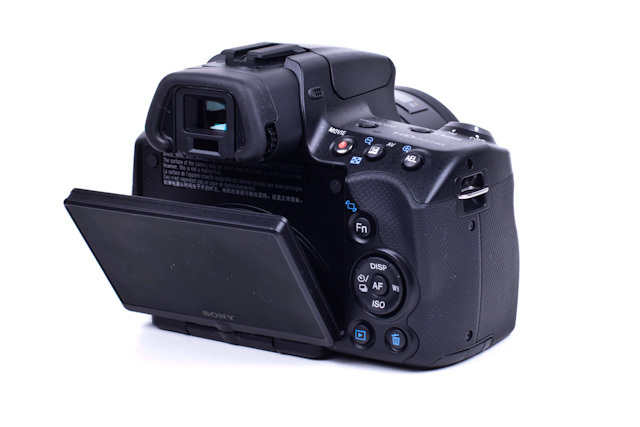 Sony NP-FW50 battery – The Sony A55 comes with one of these batteries; however, if you are going to be out and about for extended periods, it might make sense to pick up a spare. Sony HVL-F42AM external flash – The Sony A55 sports a built-in pop-up flash, but an external flash like the F42AM will give you more power and flexibility as an artificial light source. The bounce feature of the F42AM will let you bounce the flash off of ceilings or white walls for a softer, more flattering light. 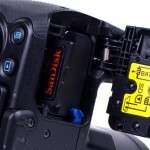 Memory Cards – If you plan on shooting video with the Sony A55, I would recommend springing for a 16GB or larger SD card. If video is not really your thing, then an 8GB SD card should meet your needs just fine. Of course, the A55 also uses Sony’s proprietary Memory Stick format. If you never plan on sharing your media with another camera, then you can feel free to go with Memory Sticks. If you are like me though, the ability to use the more standardized SD card format on other cameras and pay cheaper prices for comparable performance is an easy decision to go with SD over the Memory Stick. You can read more about the types and speed classes of memory cards available in my reference article, Demystifying SD Cards. As you have likely gathered by now, I think the Sony A55 is a great entry-level camera. Those who love the ability to frame photos using the live view display won’t find a more capable DSLR-type camera than the A55. And, if you are stepping up from a point and shoot camera, you’ll feel right at home with the A55’s user-friendly display and autofocus features. 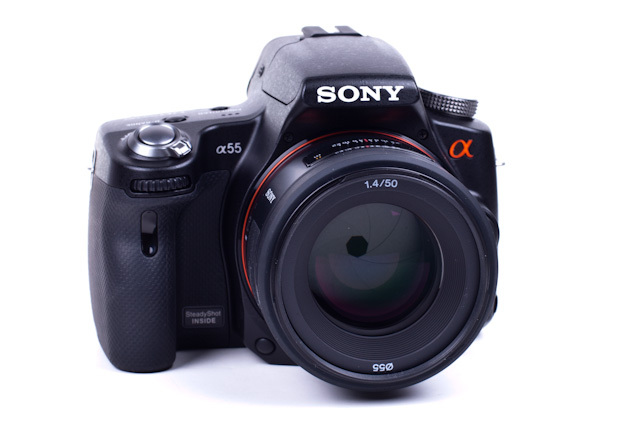 The A55 gives the novice user plenty of room to grow in both the photo and video realms. The biggest limitations I found were the image buffer when shooting RAW files at high frame rate bursts and the unnatural feel of the fast AF in video recording. 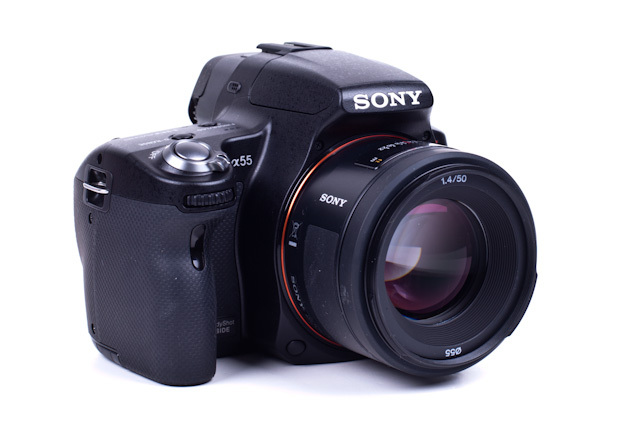 For an entry-level DSLR though, the Sony A55 will go toe-to-toe with just about any other comparably-priced camera out there. Is the monitor fully articulated? What size is the sensor? >Is the monitor fully articulated? >What size is the sensor? 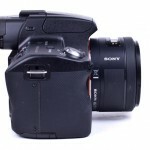 I like many of the features of the Sony cameras. Regrettably Sony has chosen to continue using the crippled bottom mounted articulated view screen, which becomes mostly useless if the camera is held at the waist or below to take a picture. Why? Sony does not use this ridiculous placement on camcorders, and competitor companies moved or started to move to they more flexible side mounted screen. Is it an in-company fight to protect their Camcorder vs digital camera division? 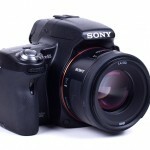 When they finally shift to use it, Sony will be following Nikon, Canon, Panasonic and ??? Sad, they should have led. It is the one reason I have had 3 Canon bridge cameras and not one Sony. Will it be the same now that I am going to move up to a dSLR? Still waiting to see how the A77 view screen works before I purchase.